Back in 2017 in wrote a post about all 3D scanning related announcements made at CES and one of them was Bellus3D — an add-on depth sensor for smartphones that lets users 3D scan their face. If you have a compatible Android phone or tablet (which are only a few at the moment) you can now buy the Face Camera Pro for $499. I can think of quite a few professional use cases for a sensor like that but I’m quite certain not many consumers are going to pay $499 to make 3D selfies. Especially if more smartphone manufacturers are going to eliminate the need of a depth sensor by offering real-time, software-only 3D selfie capture like Sony does with the Xperia XZ2. 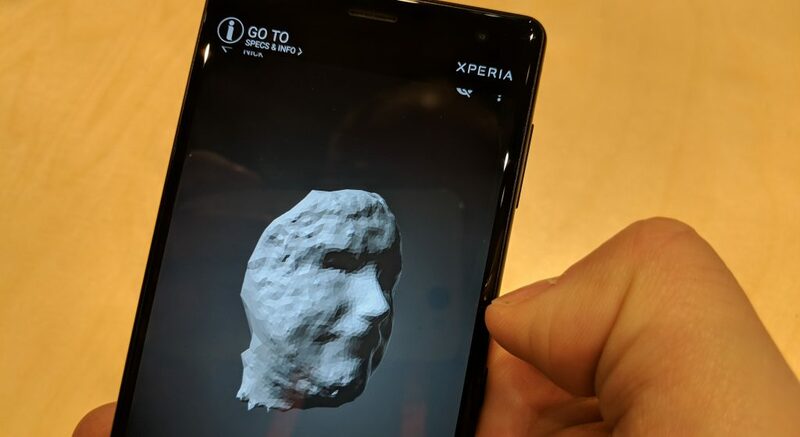 Geometric 3D mesh of my face captured with the Xperia XZ2. See result with texture here. Sony’s software-only approach relies on laying a high-resolution texture over a low-resolution 3D mesh (shown above) and the 3D models aren’t size-accurate. That’s fine for many fun consumer use cases but not sufficient for mission-critical measurement purposes like, for example, making scans for custom eye wear production. That’s why it’s exciting that Bellus3D has made their 3D scanning application compatible with the TrueDepth camera embedded on the the iPhone X.
Scanning is as simple as taking a regular selfie, with the addition of having to rotate your head. The result is a smooth, size-accurate 3D model that has a lot more geometric resolution than that of Sony’s software approach. The resolution of the iPhone X sensor isn’t as high as Bellus3D’s standalone Face Camera Pro but still more than enough for many purposes. Judging the image above, the resolution also seems to be a lot higher than depth sensors like Structure Sensor and Intel RealSense. Bellus3D Face Scan 3D Post! Future versions of the app will also allow users to export the 3D models but it’s unclear what the business model for this will be. I think the success of the app will rely on the pricing and a new wave of innovative use cases that have yet to be discovered. And, of course, it’s essential that Apple will indeed embed the TrueDepth sensor in all 2018 iPhones. Things will get even more interesting in 2019, when Apple is expected to also add the sensor to the rear-facing camera array of their smartphones. I’ve requested a Face Camera Pro to review on this website. I’d also like to test the app on an iPhone X but interestingly no one I know has one. So if you live in the Haarlem/Amsterdam area in The Netherlands and wouldn’t mind me making a 3D selfie on your iPhone X, please contact me. Follow me on your favorite social network if you want to be the first to know when I’ve reviewed either the Bellus3D Face Camera Pro or the iPhone X app. Also, I’d really appreciate it if you share this post with you friends and followers! I just stumbled on this website. Good job for keeping everyone informed. Are there cheap alternatives to the Artec 3D scanner for photogrammetry? portable would be great too. I’ve previously had experience with the Artec, Scorpion scanner and Agisoft software, though I cannot find anything that works on a smartphone which can get close to the Artec scanner. Active structured light scanning, like Artec handheld scanners, is a totally different technology than Photogrammetry. There are no mobile photogrammetry solutions on the market today that come close to the results of professional 3D scanners.